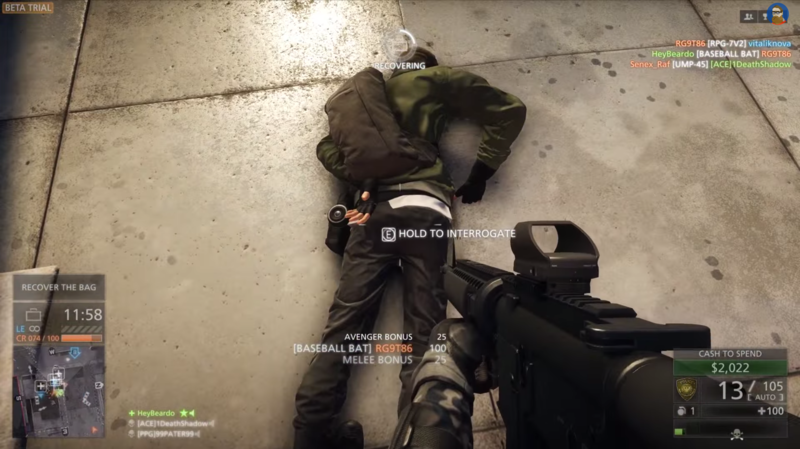 At the worst possible moment, Battlefield Hardline valorizes police violence. An early screenshot of Battlefield Hardline. The Battlefield series, one of the past decade’s most popular video-game franchises, has already given gamers the chance to play as soldiers in World War II, Vietnam, and the Middle East. Now Battlefield Hardline, slated for release early next year, allows players to assume the role of a new kind of soldier: the police officer. A recent preview of the game shows a cop throwing a thief to the ground and cuffing him; the player is given the option to Hold E to Interrogate. The officer yells, “Tell me what you know!” and earns fifty points: Interrogation successful. To Visceral Games, who developed Battlefield Hardline, the roles of soldiers and cops are so interchangeable that Army camo can simply be “re-skinned” into police uniforms. In light of the killings, riots, fear, and unrest in Ferguson, Missouri, the game raises disquieting questions about the relationship between law enforcement and citizens—in short, it’s a horror to watch. As a cop in Hardline, you’re tasked with preventing robberies and rescuing hostages, which often means shooting all the criminals until they’re dead. (The gentlest thing you can do is arrest them.) The game also enables players to take the role of the criminals, and perhaps the more troubling aspect of Hardline is that this experience is identical to playing as the police: both “the good guys” and “the bad guys” see the world through crosshairs. The best players shoot first, and shoot from behind. “In multiplayer, the world is simple,” reads the game’s website. “You’re on one side of the law or the other.” This sort of tone-deafness permeates the game and its marketing. Given recent events, one might expect the hype around Battlefield Hardline to have gone quiet; instead, it’s becoming increasingly prevalent. On August 13, four days after police shot Michael Brown, Visceral Games released a twelve-minute trailer showing off a chunk of the game’s single-player campaign. The video opens as the main character—seemingly an undercover cop—is carted off by a guy in a bucket hat who points his pistol at your black partner and says, “Race is not a factor here. My dislike of you is strictly personal.” Even when Hardline is being self-aware, it’s tasteless. Throughout the preview, a voice-over from the game’s creative director, Ian Milham, explains that you can complete levels one of two ways. The “stealth approach” allows you to sneak up on bad guys and arrest them. For each one you put in cuffs, you collect money—a bounty—that you can use to buy better weapons later. A less patient player can simply go in with guns blazing, shooting with impunity. Simply put: as a cop in Hardline, you have the choice of killing people or not. The decision is entirely dependent on your mood. The extent to which this varies from practice in the U.S., where police officers are ostensibly only permitted the use of deadly force as a last resort, is debatable. They’ve got cool motorcycles. And they’ve got helicopters. They even have police planes … And then like SWAT guys. Come on, who doesn’t like all the stuff SWAT guys load up in? They look pretty sweet. If the wars in Iraq and Afghanistan have shaken the country’s view of the military, if the rising number of school shootings has made us rethink our relationship to guns, none of these concerns have affected the robust sales of first-person shooters. In fact, as political and personal cognizance of violence has become more relevant, shooters have become more realistic, more violent, and more popular. The genre by itself has become a billion-dollar business, advancing by technological leaps and bounds each year. Are first-person shooters popular because they’re in demand or only because they’re being developed? In an interview with NPR’s All Tech Considered about video game violence, Ken Levine, the creator of a sci-fi series called BioShock, explained that game publishers are more willing to fund shooters because they’re easy to market. “A shooter answers a lot of questions for you: the main mechanic is you have this gun, you have weapons, you have enemies, you have conflict coming at you,” he said. The correlation between violence in entertainment and reality remains unclear at best, but it’s clear that games have an influence on American youth—it was just over a decade ago that the U.S. military developed America’s Army, a free online shooter that depicted ground warfare more accurately than comparable games. It was developed for seven and a half million dollars—just one-third of a percent of the Army’s annual marketing budget—and is considered one of the most successful recruiting efforts ever. Last November, Maria Konnikova explored the reasons why first-person shooters are so popular in a piece for The New Yorker. “First-person shooters put our ability to control the environment, and our perception of our effectiveness, at the forefront of play,” she wrote. The irony that law enforcement appear to have neither control nor effectiveness in Ferguson appears to be lost on the 600,000 people who, as of this writing, have watched the Battlefield Hardline preview on YouTube since it was released. Battlefield Hardline implies that the answer is a resounding yes. The tagline on the game’s website reads, “Live out your fantasy of being a cop and criminal.” Note that conjunction: and, not or. In Hardline’s universe, the two aren’t mutually exclusive—perhaps the most subversive and intelligent point it’s likely to make. Kevin Nguyen (@knguyen) is a writer based in Brooklyn, New York.